Police monitoring the situation on the M62. The M62 will remain closed into rush hour after motorists were trapped for up to nine hours. The trapped motorists have now been freed up to leave, but the highway remains closed from junction 24 to 21 because of high winds. The westbound side is closed J24-21. Police announced a diversion from Ainley Top and through the heart of Calderdale through Halifax, Mytholmroyd, Hebden Bridge, Todmorden and Littleborough. "A diversion is in place from junction 24, following the black circle route, which will take you along the A629, A646 towards Todmorden, A6033 and join the A58 to the A664 following signs for the motorway. "This is causing significant traffic delays around the area and this is compounded by the A58 Rochdale Road at Ripponden and the A640 New Hey Road, Huddersfield being closed due to heavy snow and stranded vehicles. 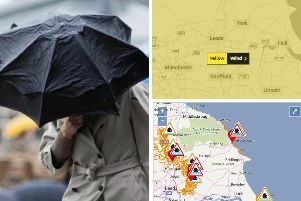 "Police are advising motorists to avoid the area and if heading towards Manchester, follow only the marked diversion route and not Sat Navs; allowing plenty of time for journeys. "Do not travel unless absolutely necessary."